MigrationWiz, a leading provider of cloud-based e-mail migration solutions with customers in over 50 countries, announced that it has migrated thousands of terabytes to Microsoft's Office 365 beta environment. With the Office 365 beta ending and general availability starting June 28, the company is expecting demand for its self-service migration platform to increase significantly. Many customers have already used MigrationWiz to transition to the Office 365 beta. As with any of our migrations, we require no hardware and no software, resulting in a streamlined migration process. Founded by ex-Microsoft engineers, the company also announced that over 1800 IT organizations have applied to its partner program. The MigrationWiz platform only uses internet-accessible APIs to implement high-fidelity migrations from Google Apps, Novell GroupWise, Exchange Server and Linux-based systems. As a result, IT organizations can perform rapid migrations to Office 365 - from proof of concept to completion - using a simple web browser without any hardware or software deployments. Behind the scenes, the company uses a global distributed computing environment and patent-pending technology to accelerate large-scale email migrations. “Visualize the timeline of all your employees e-mail communications for the past 10 years. Now imagine replaying this timeline over the course of a single day or week end. That’s how much data we have to deal with,” said Dominic Pouzin, the company’s CTO. With Office 365 transitioning from beta to general availability, many customers are now able to move forward with their migration plans. “For customers already on Microsoft BPOS, we offer an easy path to Office 365. Many customers have already used MigrationWiz to transition to the Office 365 beta. As with any of our migrations, we require no hardware and no software, resulting in a streamlined migration process," said Geeman Yip, the company’s CEO. The company also provides a solution to organizations concerned about the ability to migrate back from Office 365 to an environment such as a private cloud or a new hosted service provider. “Customers like to know there is a contingency plan in case things don’t work out. We can migrate mailboxes back and forth, with the same product and same experience, so you’re never locked in. We see this as a significant advantage compared to other vendors who can only migrate mailbox data in a single direction. Customers should expect a fall back plan,” said the company’s CEO. MigrationWiz is a complete cloud-based migration solution that helps companies move from existing to new messaging systems seamlessly and affordably. With no hardware or software to install, the patent pending technology is a solution designed to meet the needs of individuals, IT administrators, consultants, system integrators and service providers interested in migrating mailboxes. MigrationWiz is a trusted brand in over 50 countries by global Fortune 500 organizations, governments, healthcare providers, and more. Customers can sign-up, configure and initiate migrations in a matter of minutes with no prior experience. For more information visit http://www.MigrationWiz.com. 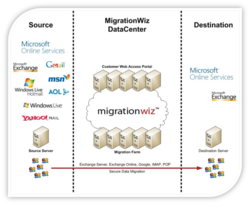 MigrationWiz OverviewOne page technical brief.